Eddy Cue seems like a nice guy. I can’t say that for sure as I’ve never met him, but he seems to be amiable enough. Maybe it’s because he has a seat on Ferrari’s board of directors. Maybe it’s because he enjoys dancing. Or maybe it’s because he’s in charge of the only real “division” at Apple. All the other senior managers have functional roles. Eddy has a bona-fide business unit called Services. 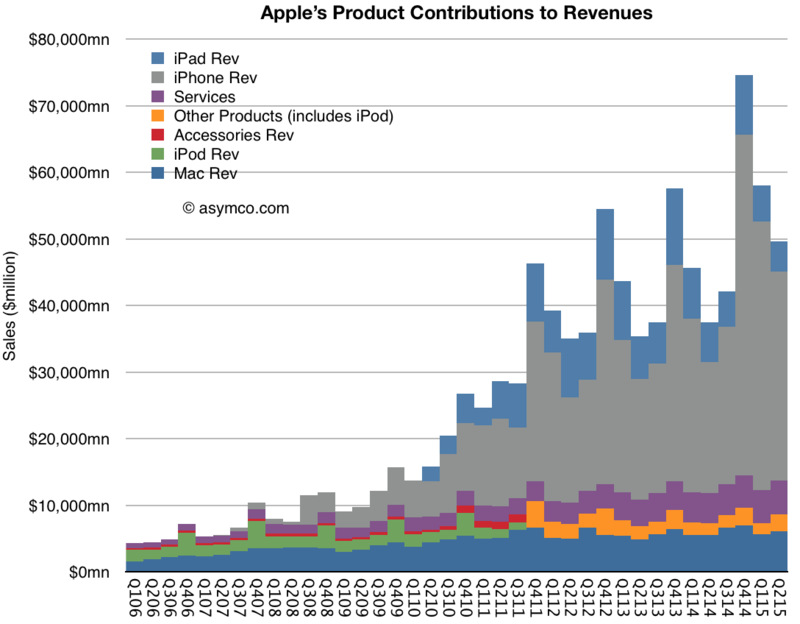 Services is Apple’s division of many things. It has the iTunes stores (Music, Video, Apps and iBooks). It has Software with consumer bundles like iWork and iLife and Pro tools like Aperture, Final Cut Pro and Logic Pro. It still has OS X as a product, though revenues are pretty low as updates are now free. It also includes Services with iCloud, Apple Music and Applecare. These things are not iPhones or iPads but they are many and all together they form a modest little unit. I say modest because not much is said about it. When seen in contrast to the other Apple product lines, it’s hard to be impressed. In the graph below it’s the purple area. Apple does not help much. Occasionally Apple offers updates on iTunes/Services using various (rarely the same) metrics. For example, in early August, Eddy Cue offered an update during an interview with USA Today on Apple Music relating how many users there were one month after the service started (11 million). It was worth a few headlines. However he also noted in passing that the App store did $1.7 billion in transactions during July. If you convert that to a yearly run-rate it comes out to about $20 billion/yr. Digging through previous announcements, the equivalent figure for 2014 was about $13.7 billion. Nice growth. However perhaps we should consider the figure in some way. It represents transactions in an economic sense–the amount people spend on apps. It’s therefore comparable with what people spend on other forms of entertainment. Movies for example. The following graph shows the spending on apps within the iTunes App Store2 as well as spending on other forms of iTunes stores as well as Services. It also shows how all the services compare with box office revenues from movies. Both the US and World-wide. 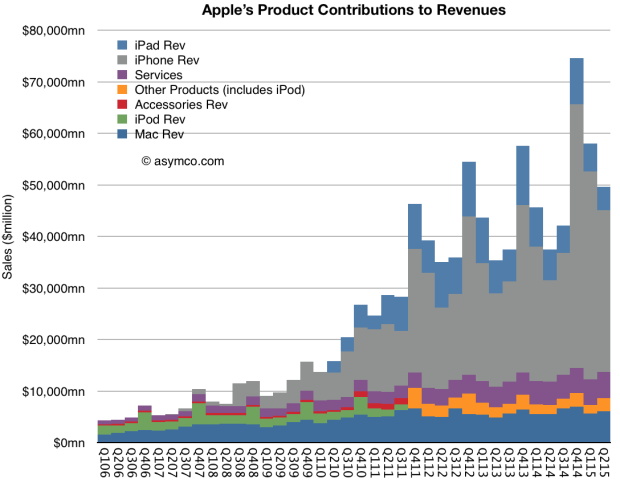 And how these figures changed over the few years that the App Store has been in existence. The individual service line items are shown in the graph on the left and the stacked totals are on the right. 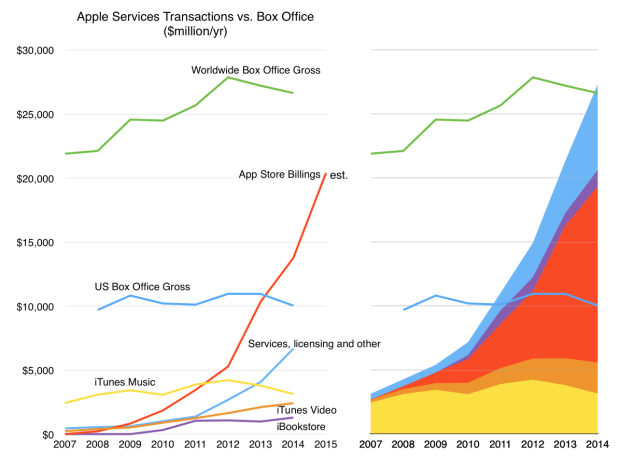 Note that already last year App Store Billings overtook US Box Office gross revenues and that Services a whole overtook Global Box Office gross revenues. It’s not likely to happen this year but next year Apple’s Apps will almost certainly overtake global Box Office in revenues. This contrast with movies gives some perspective on the creation of a new market. Apps did not exist as a medium in 2007. But, together with Android apps, apps are likely to have already overtaken revenues from an industry that is a century old. And not just any industry. Hollywood represents more than an economic power, it has a cultural power affecting perceptions and political opinion. And although universally envied, it has not been successfully replicated. So having created this market and becoming bigger than Hollywood, and grossing more than what 90 countries produce, Apple’s Services not something that is interesting to many who think about technology or even to many who think about Apple. Which is why I think Eddy’s such a nice guy. No matter how little attention is paid to his economic empire, he always seems to be in a good mood. Maybe he knows something we don’t.